Peel and chop garlic and transfer to a pot. Add butter, honey, soy sauce, cayenne pepper to the pot and let simmer while stirring for approx. 3 min. Remove from heat and let cool. Trim the top and bottom of the pineapple and remove the peel. Core and cut into bite-sized pieces. Transfer to a bowl, add shrimp, and honey soy sauce marinade and toss to coat. Refrigerate for approx. 30 min. 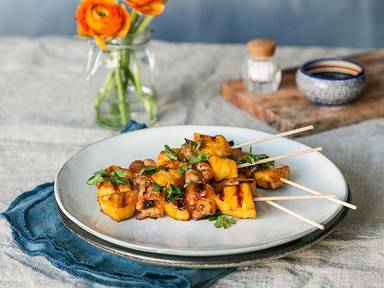 Remove marinated pineapple and shrimp from fridge and alternately thread pineapple and shrimp on skewers. Heat some oil in a grill pan set over medium-high heat and fry skewers from both sides for approx. 2 – 3 min. or until shrimp are cooked through. Remove from pan and season with salt to taste. Garnish with chopped parsley and enjoy!